March 10, 2019: An inspiring intercultural study session. 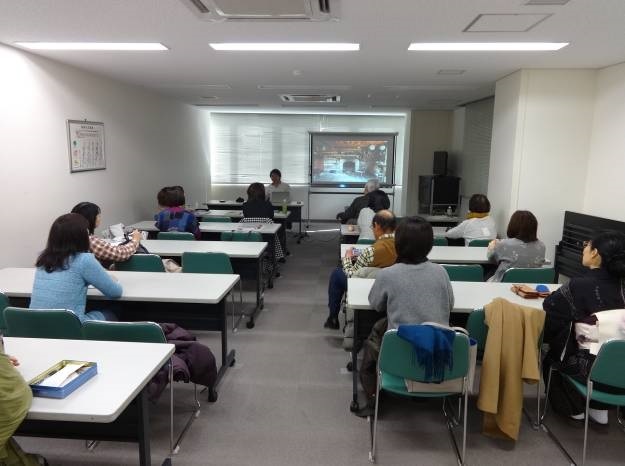 As our monthly group study, we invited a guest speaker from Fukushima Prefectural Office who was in charge of reconstruction of once evacuated municipalities. She made a presentation on the recent rehabilitation progress of the disaster affected area and the importance of hope tourism. 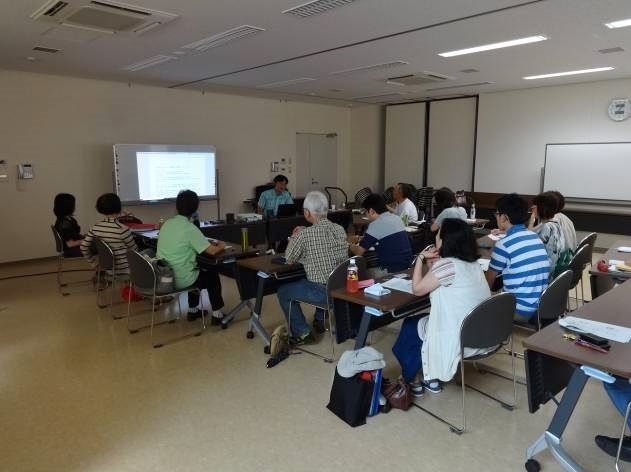 We had a discussion on how we can avoid misleading translation or expression in English when it comes to the situation of nuclear plant accident and the local people’s real voices. Then in the afternoon session, a new member of our group who had a several years’ experience of JICA project at Dominican Republic made his presentation. His work was giving vocational training on auto repair to the Spanish speaking local people. Also we had a special attendee from Barbados today who spoke seven languages. The country is located in Caribbean. We had an inspiring intercultural communication and learning opportunity. 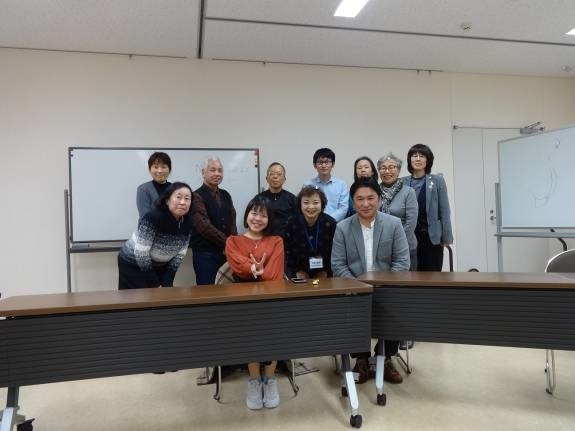 January 20, 2019: Guest speakers from Mongolia and Fukushima Seishu Academy. As our monthly group study, we invited a couple of guest speakers each from different area and learnt a lot of things. 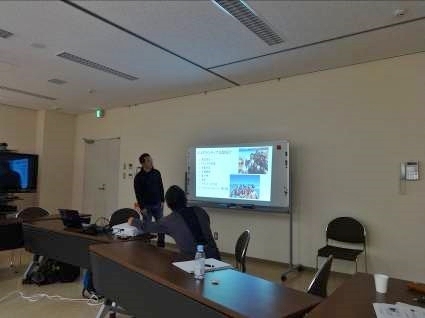 In the morning, a young multilingual from Mongolia who runs a language school LINGUIST in Fukushima City gave us a presentation about his profile and much about his home country Mongolia. We learnt a lot about Mongolian culture. In the afternoon, a former instructor at Fukushima Seishu Academy, a sake making training school for sake brewers in Fukushima, gave us a presentation. 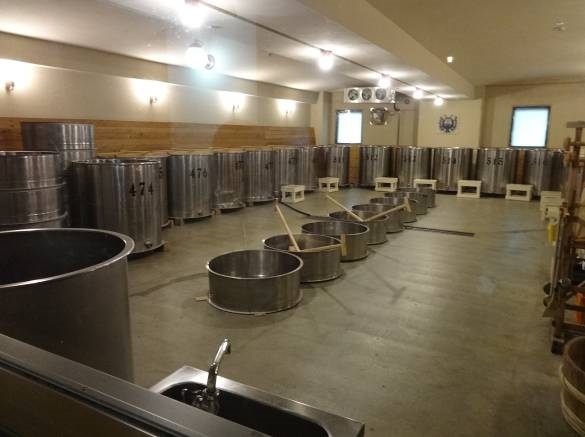 Fukushima boasts the highest number of sake breweries which won gold medals in the national sake competition for the straight six years (2013-2018). Seishu Academy contributed largely for this achievement. January 17, 2019: Studying about the latest status of Fukushima Daiichi and Okuma Town. 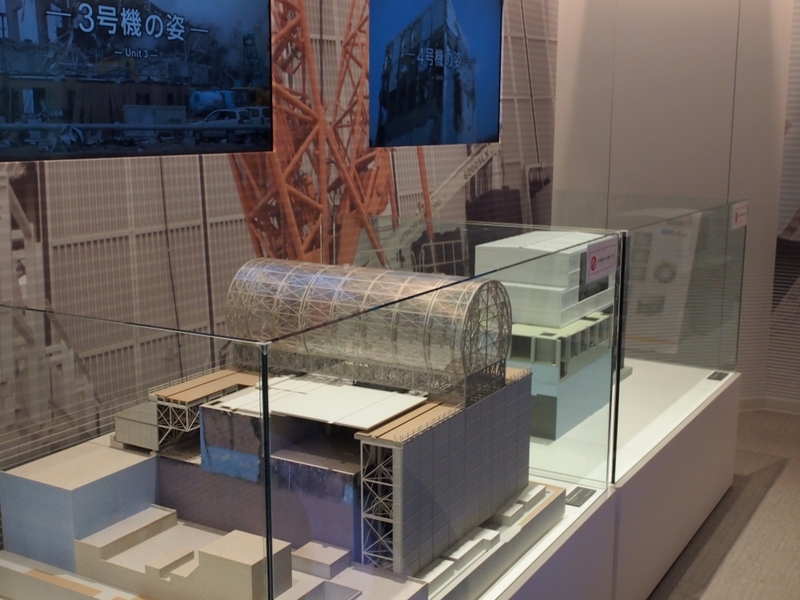 Today, some of our members had a chance to visit Fukushima Daiichi nuclear power plant complex, the new TEPCO’s Decommissioning Archive Center, and the surrounding Okuma Town. We learned the latest decommissioning status of the power plant with our own eyes, which was steadily moving forward. A new archive center located in the adjacent Tomioka Town had many new displays telling us in details about the complicated engineering process and devices. We also passed by the vast Interim Storage Facility area surrounding the power plant, which were being built for the safe storage of decontamination soil in the prefecture. And finally we visited Ono Station of JR Joban Line, which was located in Okuma Town still under evacuation order, but was expected to resume operation by March next year. During this visit we felt a powerful momentum toward decommissioning and the reconstruction image of the town. As our monthly group study, we invited a director of international division at FSG College League based in Koriyama. An international student from Vietnam also attended. Currently more than 200 international students study at the college mainly from Southeast Asian countries. At first we had a lecture from the director about the latest situation of international students coming into Japan, particularly in Fukushima, and how they continue their career after graduation. Then we had intercultural talks with the female student from Vietnam who was now studying tourism. She studied Japanese in her home country and spoke excellent Japanese. We were impressed by her positive way of thinking as to how to pave the road toward the future. We expect that these excellent young people will support Fukushima, or anywhere else in Japan, or in their home countries. Some of our members attended a 3-day study tour for a group of 16 international students from Hiroshima University. Our main destination included Tomioka and Namie towns which were hit by a triple disaster 7.5 years ago but were lifted evacuation order 1.5 years ago and are now moving forward toward reconstruction. 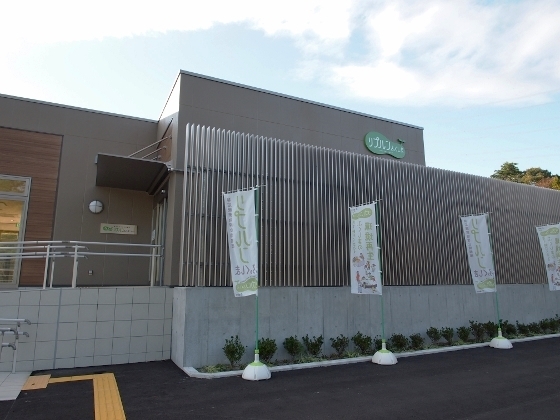 We visited several places in the area such as Reprun Fukushima which was a public communication facility for the final disposal site in Tomioka for contaminated waste, or Naraha Canvas which was a new local community center in Naraha. 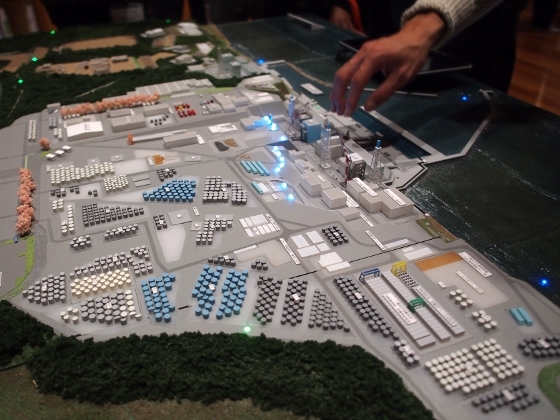 We also learned about the latest situation of Fukushima Daiichi using a precise scale model of the power plant complex. We stayed overnight at a new comfortable Tomioka Hotel with very nice and healthy meal. We heard from many local people and felt a powerful momentum and hope toward revitalization. Oct. 11, 2018: Attending Italian photographers on their visit to Hamadori region. One of our members attended a couple of Italian photographers who wanted to take pictures of tsunami hit coastal area which was now significantly recovered. We started from Soma in the north stopping at memorial hall and monument at Haragama, then traveled through Matsukawaura-Ohashi Bridge (reopened in 2017) and Osu-Matsukawa coastal road (reopened in 2018), and entered into Minamisoma. Traveling along the inland area also hit by tsunami they were interested in some trees which survived tsunami. Our final destination today was the new JR Tomioka Station. One of our members attended an Australian couple through Fukushima for their one day tour in the prefecture. 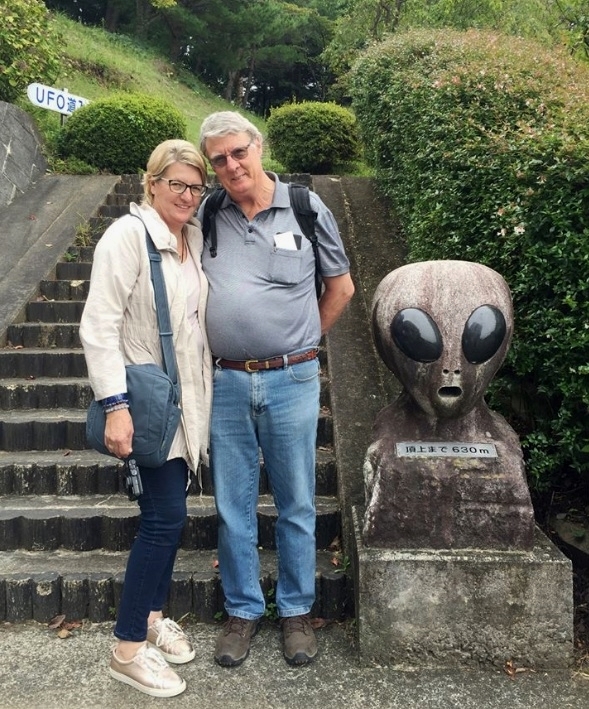 Their first stop was UFO Fureaikan in Fukushima City, which was a local interaction museum for UFO’s. Then they moved to Inawashiro Town in the south and visited a local winery and wine making workshop “Aizu”. These two destinations were of their choices and they received very warm welcome from all of the facility owners and manager. The connection of two different types of Shinkansen bullet trains at JR Fukushima Station also attracted their interest. Their last stop was Noguchi Memorial Hall at Inawashiro, which featured Dr. Noguchi who appears on the Japanese1000-yen note. Today, we had an intensive study opportunity of learning sake by courtesy of Daishichi Sake Brewery which was founded in 1752 at Nihonmatsu. 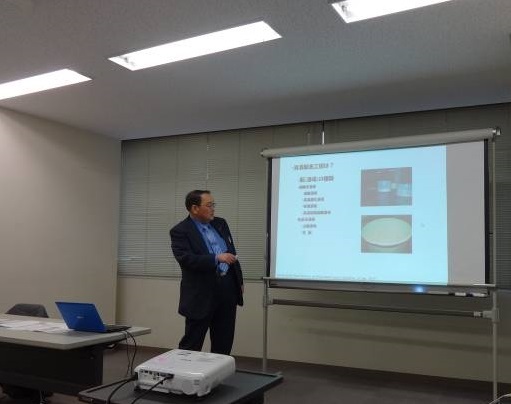 We first had an English lecture by a company executive of Daishichi on basic sake brewing process including traditional Kimoto method of making starter culture. Daishichi keeps this tradition for making all of its quality sake, while at the same time developing state-of-the-art rice polishing and other techniques. The company president guided us through the brewery with detailed explanation. Finally we had a tasting, making it clear how the difference of sake rice and making process affects the taste. It was a great opportunity for us to learn the basics of sake as well as Daishichi identity. Today, we had a regular monthly study at Miharu Town which attracts great many tourists during April every year for its gigantic thousand-year-old Takizakura and other gorgeous cherry trees. In the morning we shared each other recent guiding activities, at the town’s modern interaction center Mahora located in the center of the town. After having delicious local specialty Miharu Somen noodle lunch in the neighborhood, we moved to Commutan Fukushima which was Fukushima Prefecture’s environmental communication facility. An expert guided us through the facility focusing on the Fukushima Daiichi nuclear plant accident 7 years ago and up-to-date recovery status of the prefecture since then, as well as scientific facts about radiation in our everyday environment everywhere. We also practiced English translation with foreign residents from the U.S. and Canada attended. A couple of our group members attended a joint group of high school students from UK and Fukushima High through the tour at Commutan Fukushima facility in Miharu Town. 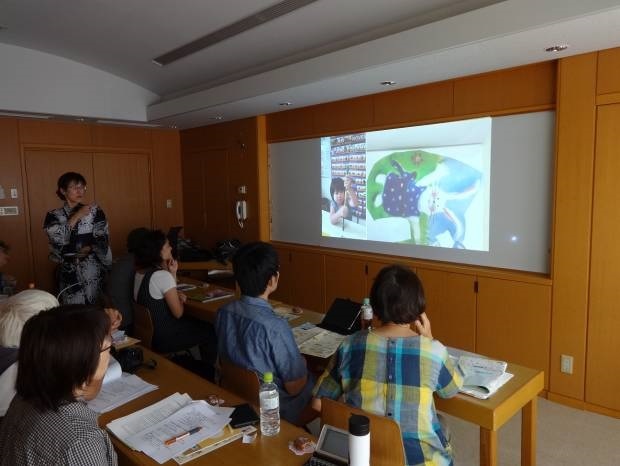 About 30 high school students from different parts in UK visited Fukushima today to participate in joint science workshop together with students from Fukushima High School which was designated as a Super Science High School. 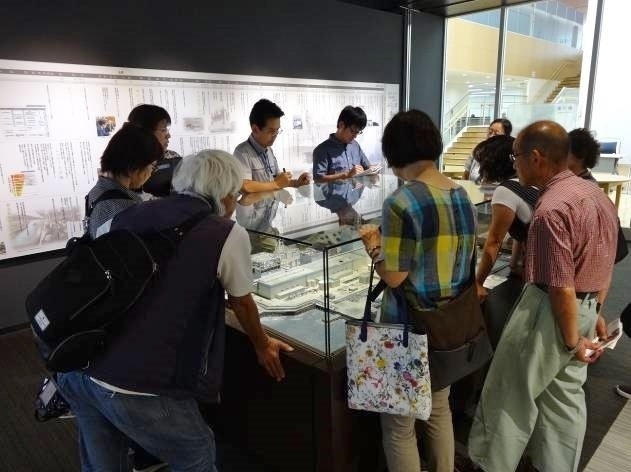 We guided them through the tour inside Commutan in groups explaining in English about the latest recovery status of Fukushima since the March 11th triple disaster, and how the nuclear plant accident happened using a scale model of the nuclear plant just after the accident. Then we moved to Radiation Lab corner and they studied about the natural radiation using cloud chamber, spark chamber, and radiation shielding game. As our monthly group study, we had two different kinds of study sessions at Koriyama. In the morning hours, we had an intensive study session on Soma Nomaoi Festival, which was a traditional festival of Soma region passed down from more than 1000 years ago making it a national important cultural asset. 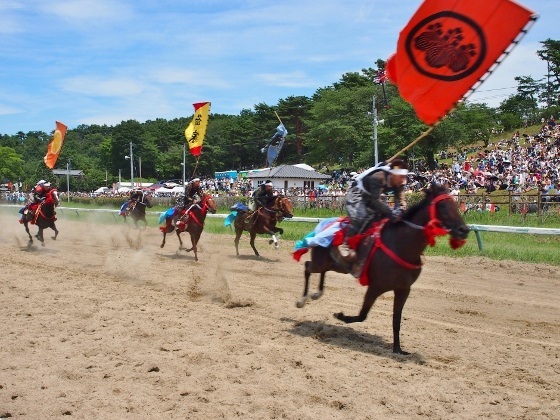 The festival for this year is scheduled July 28-30. A couple of our members from the region made in-depth explanation about the history and how the local people supported the festival. In the afternoon, a lecturer from AFW, who was a former TEPCO employee, gave us information on the latest decommissioning status at Fukushima Daiichi Nuclear Power Plant. This will be important when we talk about the plant and the status to foreign visitors to Fukushima. A member of our group attended a family trip from the United States during a tour in Fukushima Pref. The 4-member family visited Japan for 10 days, starting from Tokyo and Nikko. 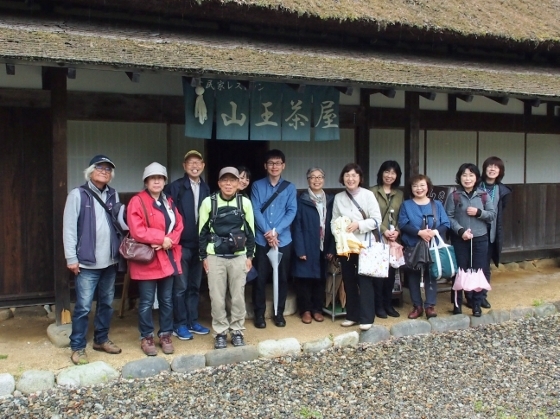 Their destination in Fukushima was Aizuwakamatsu, spending a whole half day visiting iconic places such as Tshurugajo Castle, Nisshinkan School and Bukeyashiki residence site. All the family members were moved by tragic samurai stories 150 years ago. They also enjoyed kyudo or Japanese archery experience. They finally stayed overnight at nearby Higashiyama Onsen hot spring resort. One of our members attended a business meeting on whisky import at Koriyama as an English translator. 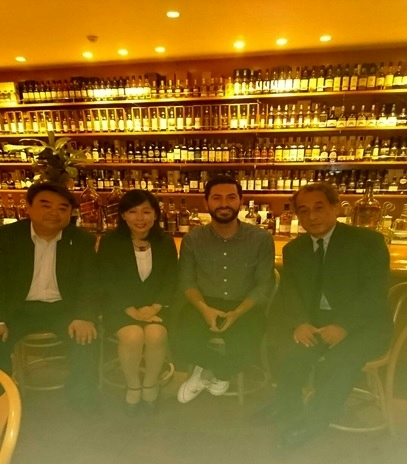 A foreign businessman visited a distiller in Koriyama for his business meeting on importing whisky products. He took plenty of time for in-depth distillery tour as well as for detailed discussion on distribution. Fukushima is now popular worldwide with its wide range of high quality sake products, taking advantage of its good natural water and climate. These are common for making whisky. As our monthly group study, we had a great experience of day trip to Minamiaizu, a southern mountainous area of Aizu region. There is direct limited express train service “Revaty” to this area four times a day from Asakusa, Tokyo, which is a popular spot for foreign travelers. Our destination today was Okuaizu Museum, located about 15-minute walk from Sansondojo Station of Aizu Railway. We had a wonderful train ride through the best fresh greenery of this season from either Aizuwakamatsu or Asakusa Station. Okuaizu Museum houses more than 3,000 local people’s tools and appliances for living in the old days and most of them are designated as National Important Cultural Assets. Old farmer’s houses and Sannojaya teahouse stood in the outdoors, which were moved and recovered in here. A curator explained us about the details and we also had translation training. It was amazing that Isabella Bird, a famous English woman, traveled through this remote district back in 1878 shortly after Japan reopened its doors to the world. One of our members attended a Japanese TV crew for 2-day coverage of Ebisu Circuit in Nihonmatsu. Ebisu Circuit, located on the foot of Mt. Adatara, is a paradise for drift riding fans, where enthusiasts from around the world can enjoy drift driving or take a drift taxi on the circuit. It became more and more popular for foreigners in recent years. The crew made interviews to foreign visitors from Ireland, New Zealand, Australia, Singapore, and others, while our member translated from English to Japanese and vice versa. A member of our group has attended a family from Indonesia. This was their 6th visit to Japan. The purpose this time was cherry blossoms viewing in Fukushima and Yamagata Prefectures. 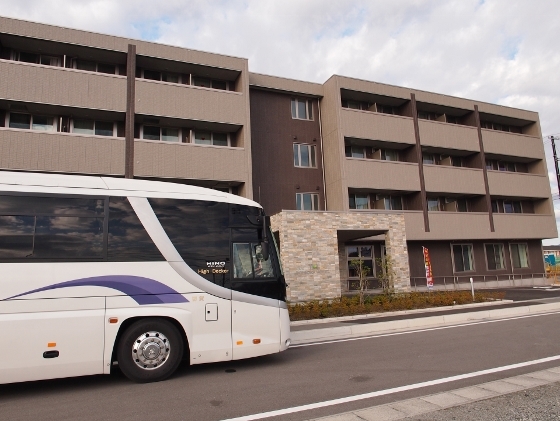 The guide picked them up at a hotel near JR Koriyama Station and guided the family through some of the famous cherry trees in the neighborhood using a sightseeing taxi. 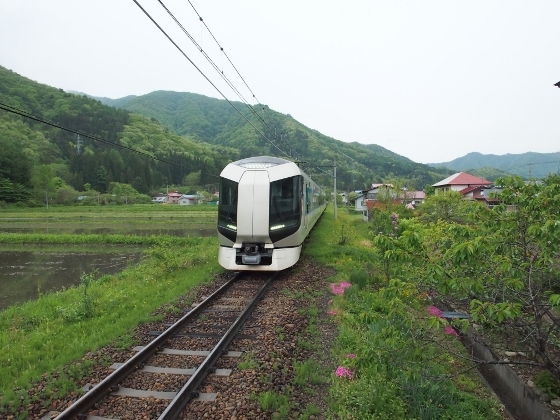 After having buffet lunch at Miharu Herb Garden Restaurant, they took JR Ban-etsu East Line train to Kanmata Station and visited Abukuma Limestone Cave. They enjoyed a tour inside the cave including a fantastic Takinegoten space. Finally, they returned to Koriyama Station ending a happy day in Fukushima. 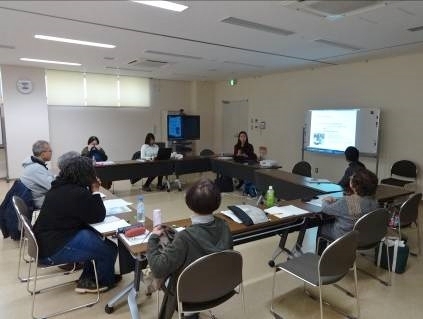 A couple of our members have attended an inbound monitor tour for foreign tourists visiting central parts of Fukushima, as English and Chinese interpreter each. 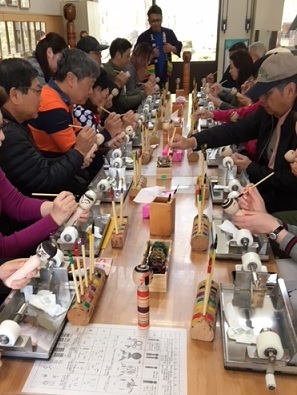 On the first day we welcomed the tourists’ group at JR Koriyama Station and guided through some of the famous cherry trees in the neighborhood, attraction sites like Takashiba Dekoyashiki folk craft workshops and Fukushima Gainax animation studio. On the second day, we visited Forest Park Adatara in Otama, Asaki Beer Community Hall, Janohana Garden, and a local brewery all in Motomiya, before they left JR Koriyama Station by Shinkansen train. Some of our members have attended Cherry Blossom Tour for 19 tourists from Singapore. Many of them were frequent travelers to Japan but it was their first time to come over to Fukushima. 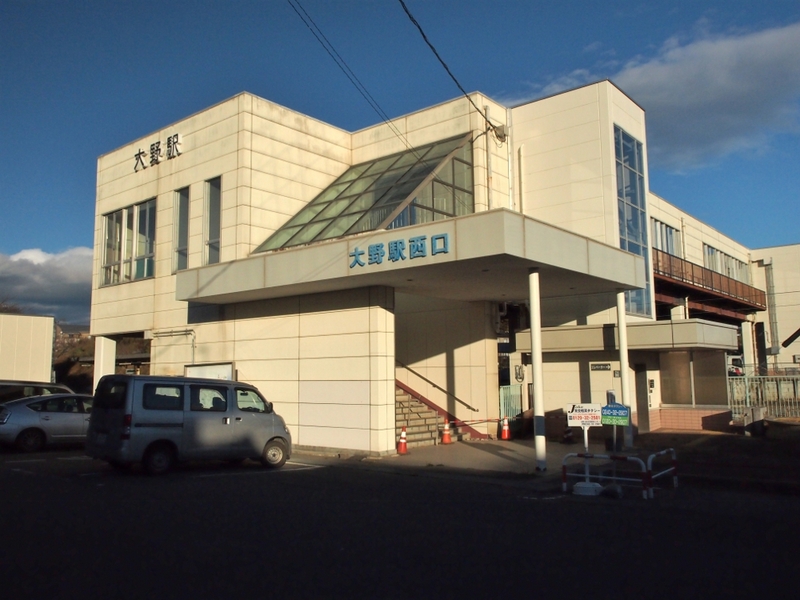 Ouchijuku was the first stop in Fukushima. Then, viewing best cherry blossoms at Yunokami Onsen Station, they headed to Aizuwakamatsu where they stayed the first night at Higashiyama Onsen hot spring resort. In the next morning, they enjoyed walking around Hanamiyama Park, viewing flower tree blossoms still remaining at this time. 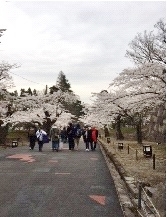 In the afternoon, they moved to Tsurugajo Castle site and fully enjoyed the best cherry blossoms of the season. The next morning they moved to Niigata Prefecture and returned to Fukushima in the evening. 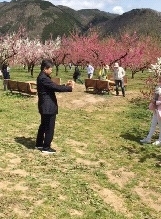 On the 4th day in Fukushima (April 16), they first visited Hanamomo-no-sato in Iizaka, where peach tree blossoms were in best season. 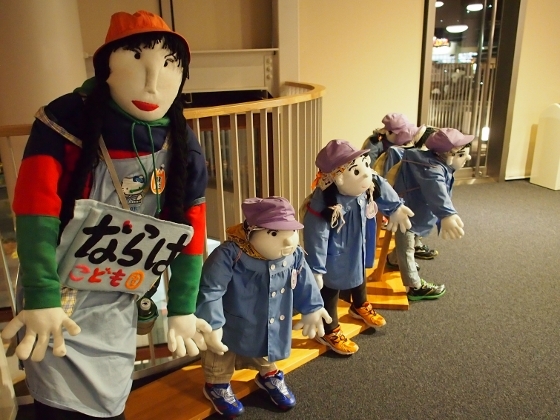 Then, they moved to Shikinosato attraction site, where they had a great experience of making their own original wooden Kokeshi dolls. In the afternoon, they moved to Daishichi Brewery in Nihonmatsu and had a great brewery tour as well as tasting experience. On the next day (April 17) all of the guests departed from Narita Airport and returned home safely. An English interpreter of our group has attended a tourists’ group from Singapore through a brewery tour at Nihonmatsu. 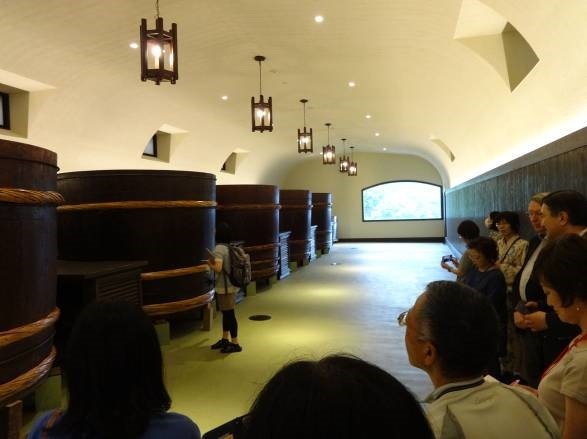 The brewery specialized in traditional method of sake making process called “kimoto” method. They had a chance of hearing from the president about many precious awards won to date. At sake tasting time the president explained how the difference was made depending on the variety of sake rice and the brewing process. The tourists had a great time enjoying sake. A French interpreter of our group has attended a French trainees’ group for a brewery tour in Nihonmatsu. The 6-member group from Normandy, France visited Japan mainly for studying trade and industry. They wanted to study and experience Fukushima’s quality sake, which has won the highest number of gold medals in the national competition for fifth straight years. We had a tour of sake making process, heard a talk by the president and finally had a tasting experience. A couple of our members have attended an American professor of architecture who usually works in Germany. He once had a group tour before through the tsunami affected region but he wanted to visit the sites again taking some time for photographs. We used a rental car and picked him up at JR Iwaki Station and guided him through many of recovered sites like new JR Tomioka Station and Ukedo fishing port as well as old Ukedo Elementary School ruins on the coastal ground. Then we moved to Kibo-no-makiba ranch in Namie, where a cattle famer continued to take care of cattle left in the evacuation zone since the Fukushima Daiichi nuclear plant accident occurred. The client made an interview to the cattle farmer. We finally returned to JR Iwaki Station.